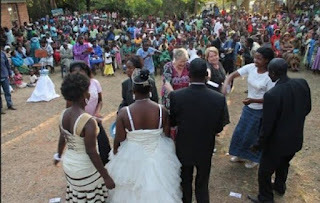 A 28-year-old pregnant woman disrupted a wedding ceremony at the Sepaase Grace Baptist Church upon hearing that her partner with whom she has one child was getting married to another lady, a member of his church. The woman, Akua Afriyie, stormed the church premises with a bottle of Schnapp when the would-be couple was being introduced ahead of their wedding to the surprise of many congregants. The Ghanaian woman invoked curses on her lover Kofi Boateng and his bride-to-be, the pastor who was to bless the marriage as well as relatives and church members who would attend the wedding. Ms Afriyie tells Nhyira FM that she has lived with Boateng for over five years and is seven months pregnant with their baby. Mr Boateng is the Youth President of the church who was living with Ms Afriyie at the mission house until the church de-fellowshipped him for six months for housing Ms Afriyie who’s not his wife. The church sanction forced the two to live in separate residences for about two years although they were still seeing each other. Ms Afriyie said she recently heard her lover Mr Boateng is about to marry another lady. According to her, she went back to Mr Boateng two months after she had delivered their baby, now two-years-old. She said after they had unprotected s*x on the day of the visit, she insisted on spending some days, a proposal Mr Boateng turned down for fear of the church finding out he was still housing her. A quarrel ensued between the two lovebirds then and she confirmed that there have been a series of quarrels since as they disagree over many other issues. Kofi Boateng who confirmed that he is getting married on Sunday added that he couldn’t marry Ms Afriyie because of her bad character and tendency to invoke curses at the least opportunity.